Want to learn a little bit more about me? Great! Hi, my name is Jean Cote. 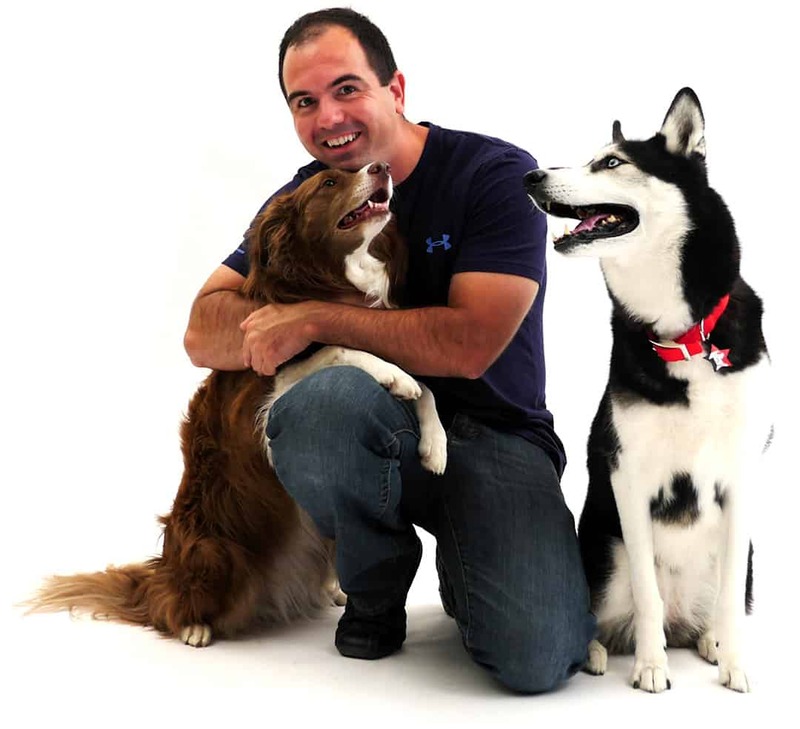 I'm the founder of Success Dogs and here's a photo of my dogs and I.
I am most known for building the Dog Trick Academy in 2006, where I brought over 10,000 dog owners together with one uniting goal: to teach our dogs cool and unique tricks. Every week, myself and dozens of dog owners from around the world would challenge our training abilities and teach our dog a specific trick/behavior. It varied from week to week... But the challenges consisted of behaviors like putting toys away, dancing on hind legs, and even incredible stuff like playing chess. Shortly after launching the Dog Trick Academy... Many people started writing to me and asking if I could teach them how they could train their dog at home. That's when I realized that many dog owners didn't have access to this information. Many of them lived in rural areas where there was no access to a professional dog trainer who specialized in positive reinforcements and force-free training methods... Or they simply couldn't afford to hire one. So, I did the next best thing – took my knowledge and compiled it into an eBook. I named it "The Power of Positive Reinforcements." It shows exactly how to get started with training a dog using positive and force-free methods. You recently gotten a puppy or adopted a dog and want to raise him into a happy, obedient and loving family companion. You've been struggling with your dog's unruly behavior and looking for a positive and force-free approach to training your dog. ...Or if you're simply looking for a simple and effective way to train your dog that is both fun and builds a greater bond with your dog. This eBook is FREE and can you can claim a free copy by clicking here. Now, I wish I could tell you that I know everything about dogs. The reality is most of my experience came through trial and error by training my own dogs. My journey with dogs started when I was just a boy when my family adopted a young off-white Lhasa Apso named Tobbie. Although he was cute and all we wanted to do was cuddle him, living with Tobbie wasn't easy. He had a number of behavioral issues, including chewing on our stuff, growling at us and peeing everywhere in the house. There was one event that I remember vividly, even to this day. I got home from school on a warm summer day, unlocked the front door and saw how my dog Tobbie had completely destroyed our living room. He had chewed on the TV remote control, shredded my mother's favorite pair of shoes. He had gotten hold of a pen and chewed it on top of the couch. There was blue ink everywhere! On the couch... On the hardwood floor... And all over Tobbie's mouth and fur. That's the moment when I felt the most hopeless about Tobbie's behavior. And we didn't know what to do. They told us to punish Tobbie anytime he did something wrong, by grabbing him by the collar and shaking him. It made Tobbie fearful of us, and he started developing aggression problems to the point where he would growl at us when we came near him. As a young boy, I was extremely frustrated with not being able to play and bond with my dog. And because my family had no access to better training methods, sadly, over time I grew apart from Tobbie. In other words, I gave up. However, during these challenging times, I made a promise to myself that would forever affect my destiny. It was... That when I grew up, I would do whatever it took to learn how to train my dog. So, a decade later, as a young adult, I adopted my first dog, a gorgeous black and white Siberian Husky that I named Onyx. Immediately after bringing her home, I enrolled her in local puppy and dog training classes where I learned all of the fundamentals of dog training, and more importantly, how to effectively communicate with my dog. It wasn't easy... But over the course of two years, I was able to train my new dog Onyx to obey my every command, and even to stay focused on me off-leash while there were eight other dogs running around. Funny thing is I wholeheartedly loved the process of training my new dog Onyx. Yes, it was challenging at first, but the results were worth it. Not only did I get the dream dog that I had always dreamed of as a young boy, it also brought me closer to my dog than I ever imagined possible. After completing dog training school, I then applied my newfound knowledge to a variety of other training adventures, including competing in dog agility. When it was all said and done, I really wanted to do something with the knowledge I had acquired while training my dogs. I wanted to help those who are in the same shoes I was in as a kid, feeling hopeless and struggling to train their dog, or who have no idea where to even begin. And that's why I built this website. 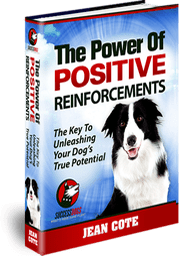 Then I would recommend that you get a free copy of my dog training eBook "The Power of Positive Reinforcements." You can claim your free copy by clicking here. And of course, there is lots of valuable dog training information on this website, so feel free to browse around. Where would you like me to send your FREE dog training eBook? I give my consent to Success Dogs and Jean Cote to send me email communications about dog training eBooks, articles, videos and lessons. I understand that I may periodically receive marketing emails.